Praised by professional musicians worldwide, the Farida Marina Guitars Creates beautiful tones. The eye catching design and quality workmanship brings great value for money. Order yours today. Farida is the guitar of choice for the new breed of Indie bands like the UK’s Bombay Bicycle Club, Deaf Havanna and The Wombats. The brand is making its mark in the highly competitive mid-priced market and is perfect for the intermediate or beginner player. Farida have a well-respected reputation for their quality workmanship and have highly impressed critics and professional musicians worldwide. Whether it’s acoustic or electric, at Lewis Eady we will have a Farida model that’s just right for you. Grand Auditorium sized guitar with solid sitka spruce top, mahogany back and sides, and rosewood fingerboard and bridge. A good solid sounding and feeling guitar that will inspire students to greatness. Grand Auditorium sized guitar with solid sitka spruce top in a matte finish. Mahogany back and sides, and rosewood fingerboard and bridge. Value and tone are just a strum away. Dreadnought sized guitar with solid sitka spruce top in a matte finish. Mahogany back and sides, and rosewood fingerboard and bridge. Ample volume without emptying the wallet. Dreadnought sized guitar with solid sitka spruce top, mahogany back and sides, and rosewood fingerboard and bridge. A fantastic entry level solid top guitar. This 12th fret, slotted head stock model is oozing retro style and feel. Solid spruce top in a matte finish, mahogany back and sides tastefully finished with a white binding. If vintage looks are what you desire then we have you covered. A step up from their 10 range, the R-16 has a sitka spruce top and rosewood back and sides, the classic tone wood combo! Boasts sweet highs and tight bass. All solid wood, all solid tone. 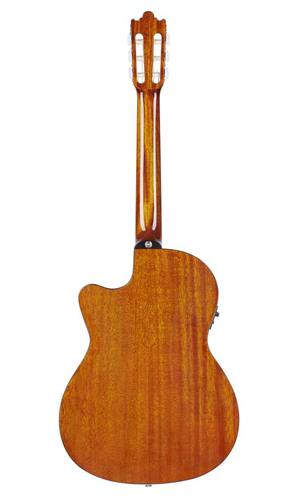 Grand Auditorium shape with solid spruce top and solid mahogany back and sides, and rosewood fret board. Beautifully finished with a bound neck and abalone inlayed rosette. 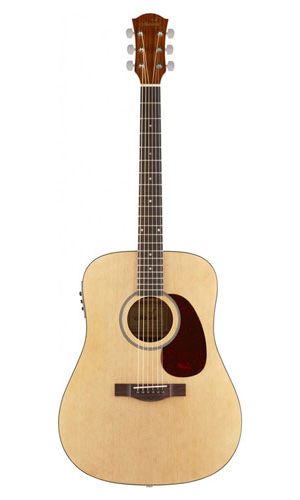 Affordable dreadnought acoustic/electric with classic natural looks. Comes loaded with a Fishman Isys T pick up and tuner. Plug in and play. Affordable dreadnought acoustic/electric in black gloss. Comes loaded with a Fishman Isys T pick up and tuner. Plug in and play. Entry level acoustic/electric guitar with a fantastic 'tigerburst' finish. Fishman Isys T pick up and tuner allows you to amplify this affordable guitar.